Orchids Are As Hot As Ever! BroCars International Trading has launched its new translucent version of its popular Crackpotsâ - brand orchid pot. The pots are made of resin in 8 amazing colors ranging from Dirty Olive to Dazzling Pink. 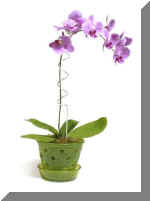 Crackpots offer function, great design and can help orchid admirers become good orchid growers. Crackpots provide the necessary air circulation with lots of style!